The genetics underpinning a smoker's risk of developing lung cancer have been further unpicked by UK scientists. Three areas of DNA were found to be linked with lung cancer risk in smokers, two of them influencing the type of cancer which develops. It supports previous studies which have suggested a family link, even after taking smoking into account, a report in the Cancer Research journal says. Smoking is responsible for nine out of 10 cases of lung cancer. The Institute of Cancer Research team compared the DNA of 1,900 lung cancer patients and 1,400 healthy individuals. Information gathered on areas of genetic risk was then tested further in another 2,000 patients with lung cancer and a similar number of healthy volunteers. Specific differences associated with lung cancer risk were found on chromosomes 5, 6 and 15. Those with certain genetic changes on chromosome 5 were more likely to get a type of cancer called adenocarcinoma and the region highlighted on chromosome 6 seemed to influence whether a patient developed adenocarcinoma or another type called squamous cell carcinoma. On chromosome 15, they pinpointed two independent sites that have a role in whether or not a smoker develops lung cancer. These areas of the genome contain a family of genes that influence smoking behaviour but also cell growth and cell death. Current or former smokers who carry one copy of each of these genetic variants increase their risk of lung cancer by 28%. That increases to 80% in smokers who carry two copies. 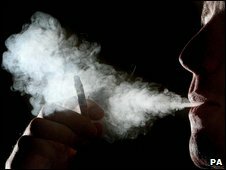 Those who had the genetic changes but did not smoke had no increased risk of lung cancer. Study leader Professor Richard Houlston said the findings confirmed earlier research. "The next step is to dig deeper to pinpoint which gene, or genes in these regions, cause the increased risk of developing lung cancer and how they actually trigger this increase." Dr Lesley Walker, director of cancer information at Cancer Research UK who partly funded the research, said smoking was responsible for the vast majority of lung cancers. "This research shows that inherited genetic variation accounts for some of this risk and the type of lung cancer that develops." She added: "The best thing a smoker can do to reduce their risk of lung cancer, and a range of other life-threatening conditions, is to quit." Dr Noemi Eiser, honorary medical director of the British Lung Foundation, said: "This research is very interesting as it provides further clues as to why some smokers are more prone to developing certain types of lung cancer. "We now hope that with more research this discovery will lead to the development of early screening techniques and treatments for lung cancer, which is currently the UK's biggest cancer killer."